Iris and I led Atlanta Audubon's first kids walk at Cochran Shoals Unit in November and, disappointingly, we had only three very small children, their parents and few other beginners showed up at 8:00 AM.We thought we might need to make a later meeting time for the kids walk. Second children field trip will meet at 9:30 AM to see if we have a better turn out. In this trip led by Eddie and Iris, we had 8 children from Boy Scouts of America, Troop 12 of Griffin and one 4-year old and, with 7 other adults in attendance made this trip a total people of 18. Iris called me at around 9:30 AM and wanted to make sure that I knew the place. I told her I know the area well and we were just running a little bit late. I car-pooled with Joy Carter's family and arrived at Newman Wetland Center at around 10 AM. But we did not miss fun part of this trip. As soon as we arrived at Newman Wetland Center parking lot (2755 Freeman Road Hampton, Georgia 30228), Fallou (a 4-year old boy, Joy's grandson) put up his binoculars with his "over sized" harness (he is just too small to fit into an adult-sized harness) and he was ready to seriously look for some birds. 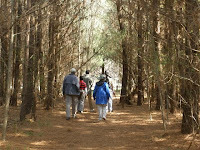 Eddie and Iris led the group from walking through the wetland trail and we soon reached their group after signing in. Most kids were first time birding and Atlanta Audubon Society (AAS) prepared extra binoculars for them to borrow. Thanks to Iris for carrying a big backpack for these binoculars and field guide books. Eddie and Iris were so patient and unwearyingly reminded the kids, "this is a Song Sparrow, that was a White-throated Sparrow, here comes a Carolina Wren....". While trip leaders explained birds, their habitats and behavior in detail, an 11-years old boy tried very hard to remember the call notes of White-throated Sparrow. He told me he really enjoyed this trip and he wanted to come back again and bring his whole family next time. We left trail at around 11:45 AM and headed towards E.L. Huie Pond. The fun part of this trip, at least to me and, Fallou, just started! Joy was our dedicated driver today. After entering the gate and catching up with three other cars, I saw this big waterfowl struggling and trying to swallow one large fish. As I turned on my camera, I shouted out to the others, " Look to your right, in the water, there is a Double-crested Cormorant just caught a big fish!". Fallou was the first one yelled back, " Where? Where? I don't see it!". As Joy stopped car completely, I rolled down my window and pointed the bird's location to Fallou and others, at the same time I quickly snapped few shots of cormorant's fishing action. Pictures were not too ideal but truly memorable. At the end of trip, we observed 25 species in Newman Wetland trail and 35 species in E.L. Huie Pond with a combined total of 52 species not counting Fish Crow we heard and Least Sandpiper we saw after Eddie and his boy scouts left. When I returned to Joy's home, Fallou ran to his Great Grand mom and showed her a picture of Hooded Merganser from The Sibley Guide. Joy and I were so amazed by this 4-year old and he didn't seem to be tired at all! He told me he wanted to bird with us again soon. We gave each other a warm hug and said good-bye. Thanks to Atlanta Audubon Society Field Trip Coordinator, Stan Chapman and our field trip leaders, Eddie Hatchett and Iris Schumacher. This trip will not happen without their detailed planning, organization and coordination. Most importantly, thanks to their passion for birds and devotion for youth birding programs to bring fun and avian education to an outdoor classroom. BRAVO, BRAVO! This blog is superb! You've done such a wonderful job capturing the day in words, photos, video and music. You have my vote for best blog of the year! I am so amazed with your work. You are the Director of the year on this true "Reality Show". I think you have a talent in Film making and or directing as well besides making Birds, children and Birders happy. This post will not happen without your dedication of being our Field Trip Director! I salute you!! I think its important to get young people out in nature as often as possible. I went through your slide show. What a great way to view your photos. Boom & Gary of The Vermilon. Thanks to Boom and Gary! 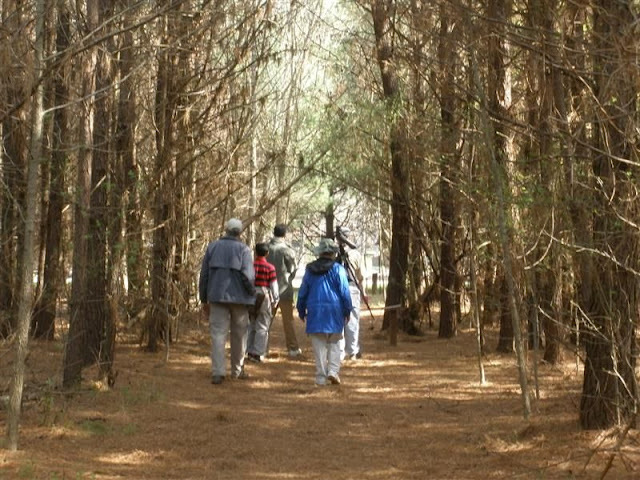 Atlanta Audubon held the first two kids bird walks this year. We are planning to have trips in the new year. Speaking of the New Year, I will be very busy for this year's Christmas Bird Count!